Synthetic emerald is made by two methods namely hydrothermal and flux. this method has been developed to produce emeralds in colorless beryls. The first commercially successful emerald synthesis process is Carroll Chatham, which probably involves the process of solid vanilla flux, because the Chatham emerald has no water and contains vanadate, molybdenum and vanadium. Another emerald producer of large fluxes is Pierre Gilson Sr., the product has been marketed since 1964. 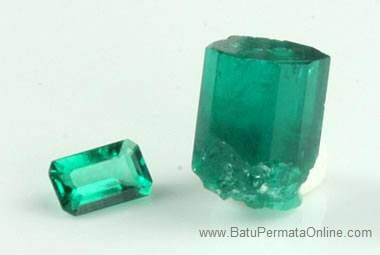 Emerald Gilson is usually planted in natural colorless beryl seeds, which are coated on both sides. Growth occurs at a rate of 1 mm per month, a typical seven-month growth that produces emerald crystals with a thickness of 7 mm. Emerald synthetic hydrothermal has been associated with IG Farben, Nacken, Tairus, and others, but the first satisfying commercial product was Johann Lechleitner from Innsbruck, Austria, which appeared on the market in the 1960s. These stones were originally sold under the names "Emerita" and "Symeralds", and they grew as thin layers of emerald on colorless beryl stones. Then, from 1965 to 1970, the Linde Division of Union Carbide produced purely synthetic emeralds with hydrothermal synthesis. According to their patent (caused by E.M. Flanigen), acidic conditions are very important to prevent chromium (which is used as a dye) from precipitation. Also, it is important that nutrients containing silicon are kept away from other materials to prevent nucleation and limit growth in seed crystals. Growth occurs with a diffusion reaction process, assisted by convection. The largest producer of emerald hydrothermal is Tairus in Russia, which has succeeded in synthesizing emeralds with chemical compositions similar to emeralds in alkaline deposits in Colombia, and its products are known as "Emerald Made like Colombian Emerald" or "Tairus Created Emeralds" Luminescence in ultraviolet light is considered a complementary test when making natural vs. synthetic determinations, because many, but not all, natural emeralds are inactive against ultraviolet light. Many synthetics are also UV inert. Imitation emeralds (imitation) that are often found on the market include: glass, YAG, triple synthetic spinel, green cubic zirconia, and beryl triplets. 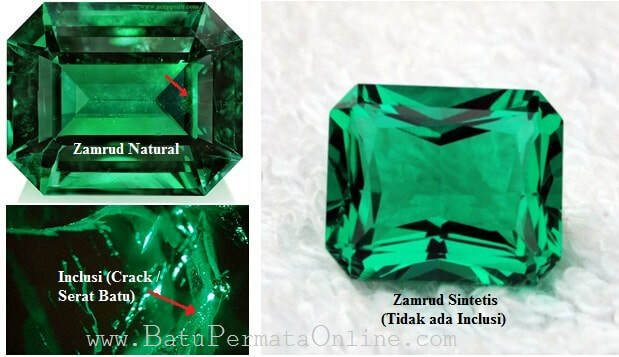 In the last fifty years, two main processes have been developed to produce "lab created," or synthetic, emerald. If you have looked at the prices of synthetic emeralds, you might be wondering why the price is so expensive compared to other synthetics such as CZ or some types of synthetic sapphires. Both flux and hydrothermal production methods require expensive and energy intensive equipment. They take a long time to produce emeralds. Some of the first laboratories to create synthetic emeralds on the market are inconclusive because they are very clean, but today's sophistication of consumers has led to a more natural tendency towards synthetic inclusion. Although this increases their acceptability, it makes it a little more difficult for gem experts and assessors to prove natural origin. Fortunately, there are signs, especially regarding the type of inclusion in gems, which can conclusively verify natural and synthetic origin.